CONGRATULATIONS AND MANY, MANY THANKS TO ALL!!!!!!!! ​​A SPECIAL THANKS TO PCAC DIRECTOR SHELLEY SWEENEY, WHO DEVISED AND COORDINATED THE PROJECT AND TO ALL THE VOLUNTEERS WHO HAVE PUT IN SO MUCH EFFORT AS WELL AS TO THE PARTICIPANTS THEMSELVES WHO HAVE ENSURED THE GOAL OF 6048 SQUARES WAS REACHED! 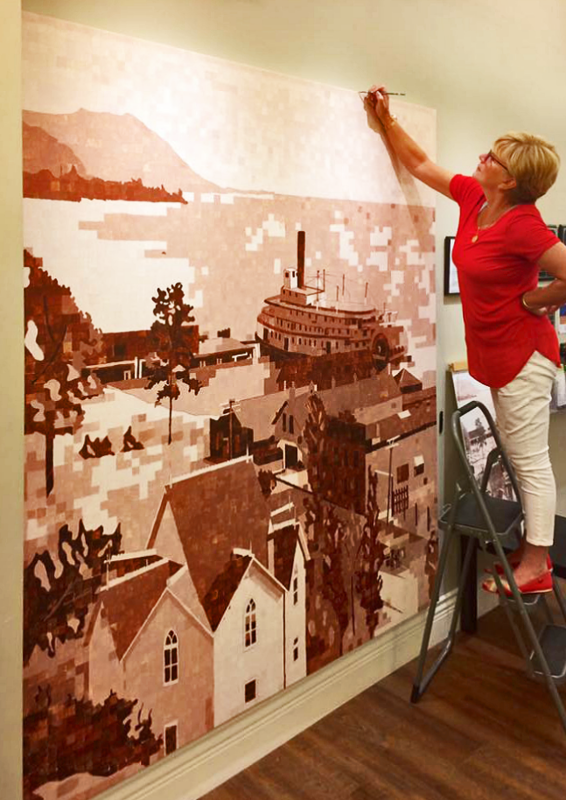 Shelley Sweeney fills in the final square of the Canada 150 Paint-by-Number project. We did it! All 6048 squares have been painted! In celebration of Canada’s 150th Birthday the Peachland Community Arts Council unofficially for a few months broke the Guinness World Record (the largest number of participants painting a ‘paint by number’ at one venue). 6048 visitors to the Peachland Art Gallery painted a ONE – 1” SQUARE on our 6 x 7 foot canvas, and signed our participants log book acknowledging their work and recorded their square number. The previous world record holder for a paint-by-number prior to that was populous Victoria in Hong Kong, China with 2603 participants. However, that record has now been beaten in December 2017 by the city of Doha, Quatar, with a gigantic 24 by 35 foot giant image of the Emir of Qatar. Thanks to you, our members, to visitors from around the province, country, even the world, and most of all to our wonderful volunteers – Peachland with its Art Gallery is now proudly on the Map. It has been fun for a short time being number ONE and in this way celebrating Canada’s history.